We were off work for the MLK holiday on Monday. It threw me off all week about what day it was, in a most pleasant way. I have a couple of new-to-me terms today that relate to recent politics. The president got a physical exam this week, and among the reported results were his height and weight. The report set off speculation in some quarters that these numbers had been finessed, and that the weight report was purportedly at odds with photographic evidence of the president's physique. Trump was (is?) a prominent birther, i.e., someone who maintains that Barack Obama was not born in the U.S. So I was quite amused to read that there's a name for people who are skeptical of the president's reported weight: girthers. This term was obviously invented just this week, so it's not just new to me, it's actually new-new. Related terms are girther movement and girtherism. This is funny, right? But let's see whether anyone remembers this word in a month. There was also that incident last week in which the president allegedly referred to "shithole countries." This was reported second-hand, which led to a confusion of assertions and reactions: Trump didn't say it; he said something different; anyway, it's true. I don't know how widely the term kettle logic has been used to describe political doublespeak over time. It's certainly gotten a workout recently—when I went looking for examples of kettle logic, I found people using it to describe tweets about a proposed recount after the 2016 election; the Michael Flynn situation; and meetings with Russia. Trying to make sense of these types of conflicting stories can be a challenge, but at least we have a good name for them to lighten our spirits. The other day I was watching the old version of The Thomas Crown Affair, and a scene came on where Steve McQueen is playing polo. I spent a few minutes trying to puzzle out where the word polo might have come from. Italian, maybe? Spanish? No. 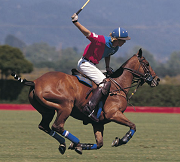 The word polo originated in a Tibetan language, where it meant "ball." The game and word spread across south Asia and was adopted by the British during their sovereignty in India. But my guess about Italian or Spanish wasn't completely wild. Polo is also (entirely separately) the name of a particular style of flamenco song. Although as I recall, there were no scenes in the movie where Steve McQueen performed such a song.